Blog: Farrell's Job Fair Today!!!!! Interviews will be held from 11 a.m. to 2 p.m. and 5 p.m. to 7 p.m. Thursday. On Friday interviews are from 9 a.m. to 11 a.m. and 1 p.m. to 3 p.m. Address: 8650 Beach Blvd., Buena Park. 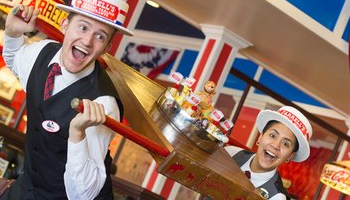 arrells Ice Cream Parlour in Buena Park, temporarily closed for a major remodel, is looking to hire a new crop of employees. And unlike job fairs of the past, drummers and singers need not apply. Will not require applicants to perform, marketing director Shauna Parisi said. We are looking for employees with restaurant industry skills who can both engage and entertain our guests. The restaurant, now run by Marcus Lemonis of The Profit, said it plans to hire 120 employees including bartenders. The job fair will be held Thursday and Friday at the store. Parisi said former employees will need to re-apply. The 2-year-old Buena Park location previously was owned and operated by Lake Forest-based Parlour Enterprises. After Farrells ran into financial troubles last year, Parlour Enterprises appeared on Lemonis business rescue show The Profit. During the show, it was revealed Farrells stores were in debt nearly $2 million. Lemonis, who has invested more than $35 million in companies featured on his reality show, decided to invest in Farrells. His initial buy-in was $750,000. However, in early February, Lemonis told the Register he had to rescue the company again. Farrells, he said, owed its Buena Park landlord nine months rent to the tune of $200,000. The company also was not paying its vendors. On several occasions, I had to loan them money to pay employees, Lemonis said. As soon as his company ML Foods took a 51 percent ownership stake in the brand, he closed the Buena Park restaurant to remodel it. He said he plans to replace worn furniture and kitchen equipment. ML Foods also owns a majority stake of Amazing Grapes, a wine bar in Rancho Santa Margarita featured on The Profit in 2014. When the Buena Park restaurant reopens, we will have one Farrells that will be perfect, Lemonis said. At the time of the closure, he said some employees would not be rehired because many of them had terrible attitudes. The hiring fair is looking to fill front and back of the house positions, including servers, bartenders, cooks and soda fountain workers.